Could there be anything better than a science family? Not in my opinion, but let’s take a closer look. A science family is your run of the mill nuclear family with one big difference, the driving force behind its cohesion is science. How would this work? Easy, but it has to start with a symmetry between both parents. The critical element is that both parents share a common passion for science. The reason is that it takes a concerted effort to plan the science lifestyle for a whole family. Only one participating parent just wouldn’t produce the necessary congruence. A good path for having your own science family probably would start with a science relationship (see previous Science Lifestyle blog post on Tuesday, May 19 for details) and then let nature take its course. Let’s explore how life might be in a science family. It would have to start with introducing the children to science early on, definitely during the preschool years and continuing through their traditional education years K-12. Given the state of math and science education these days, the activities of a science family could supersede what the child learns in school. The underlying theme of the family would be science, from weekly home experiments, to watching science shows on television, to science outings, to science vacations, and to science-oriented activities around the house. At a basic level, a science family would always exhibit curiosity about nature and the world in which we live. 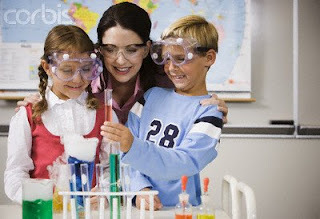 A science family could spend hours of quality time together in a home science laboratory. This could be a retrofitted garage, shed, or stand-alone building on your property. I always envisioned an underground science lab bunker with a telescope dome on top. There would be a spiral staircase in the lab leading up into the dome for easy access. The lab would include a life sciences lab bench for conducting chemistry/biology experiments. It would have the standard complement of chemicals, beakers, test tubes, Bunsen burners, and a good digital microscope. You’d also need an electronics test bench with test equipment such as a variable power supply, digital oscilloscope, signal generator, laser, digital multi-meter, etc. You might also have a separate physics experiment area with photon detector for a double-slit experiment to demonstrate quantum effects to your friends. Of course you’d need plenty of computers for monitoring scientific experiments around the world (like the Ice Cube neutrino detection experiment in Antarctica). And needless to say, you’ll need plenty of power including a back-up gas generator. The kids would be instructed in the use of most of the equipment and needless to say, safety procedures would be a top priority. Science activities around the house would be fun and educational. For instance, you could have a weekly science themed family dinner where you pick the top science news item of the week and have a discussion at the dinner table (note: the TV is off during dinner time in a science family). The kids would look forward to their weekly dose of science. To spread the wealth, you could invite one or two neighborhood kids to join your weekly science dinner. Hopefully, the visiting kids will report back to their own parents about how fun your science house is. Family science outings could be the high point during each month. This is where dedicated science parents come in. Parents need to keep their eyes open for kid-friendly science events around town. Joining your local Science Café would be a good source of event information. But science events don’t have to be formal ones, a visit to a beach tide pool, nature walk, or even the zoo can be approached with a science point of view. Each of the kids would be given their own lab notebook so they can record their observations in order to learn the scientific method. To me, the concept of a science family is an exciting prospect. But it’s not easy to maintain a science family and the parents will have to do some work. The results, however, clearly will be seen in the children’s increased knowledge, intelligence, grades, confidence, and life prospects. Parents should be willing to go this extra mile to benefit their kids; that’s why they chose to have kids in the first place, right? As a physics groupie, I’ve always aspired to have a science family. I guess it would help to have kids first!